The newly appointed Chairman of the Sri Lanka Tourism Promotion Bureau (SLTPB) and Sri Lanka Tourism Development Authority (SLTDA), Kishu Gomes yesterday promised to bring in a minimum of three million tourists to the island this year, capitalising on his over three decade experience at United States-based multinational corporations. 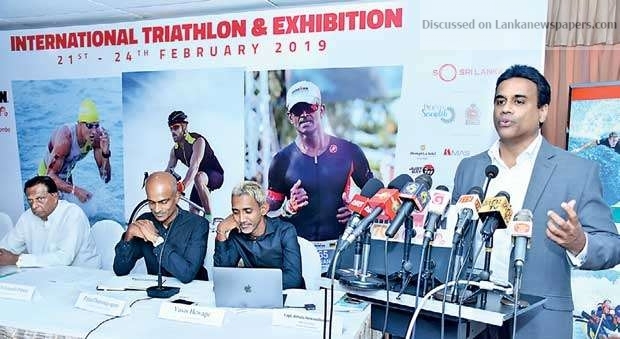 Participating in his first major event, the announcement of the second edition of “So Sri Lanka Ironman 70.3 Triathlon” in Colombo, he said “I am very excited about the opportunity being presented, and I promise you that I will use all the experience gained over the past three decades to do what is right to promote Sri Lanka tourism. Gomes told Mirror Business that SLTPB is likely to have a soft launch of the long-delayed Global Tourism Promotion Campaign at the world’s largest tourism trade fair, ITB Berlin this March to get the best possible visibility for “So Sri Lanka” brand and the campaign. The three-year campaign which received SLTPB board approval recently will focus on promoting Sri Lanka tourism in 8 key source markets of Sri Lanka tourism with an estimated budget of Rs. 3 billion. Gomes placed his full confidence on plans and processes of SLTDA and SLTPB to achieve these targets this year. He praised the public procurement process, valuation process and decision making mechanism, noting that the public sector is on par with the best of private corporates in these segments. “The process that the bureau has in place in order to value the events and how the valuations are done as well the procurement process they follow which bases on how the decisions are made, are as good as the best in the private sector. “A lot of people tend to think that private sector is “the thing” and the public sector should follow the private sector. Here is an example how the public sector meets the best of standards of private sector. I am not saying it because I am now attached to the public sector. I am saying it based on what I have experienced during the past two days,” he explained. Gomes said that his marketing background in particular will help achieve the objective of Sri Lanka Tourism. “I have a marketing background; my DNA is marketing and brand communication as you all know. We have good plans in place to showcase what we got as a nation,” he emphasised. Gomes asserted that he will focus more on the non-conventional sectors such as sport tourism to achieve tourism numbers that are targeted for the year. ← The traditional chief guest not even invited!